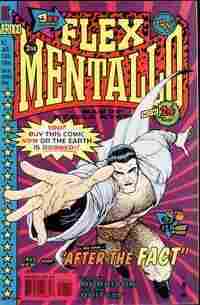 New Year, New Changes; Also, FLEX MENTALLO! HERO OF THE BEACH! DC and Marvel shake things up, and one of the weirdest heroes of the past 20 years makes his triumphant, deeply weird, return. The Big Two comics publishers have kicked off 2011 with changes big and small. Quesada will stay on in his position as Marvel's Chief Creative Officer -- meaning he'll continue to oversee the portrayal of Marvel characters in film, video games, television, animation and (nervous cough) theater. At DC, the change to the status quo is considerably smaller, but significant. They're bringing back the letters page. Until DC did away with it in the early 00's, the letters page was as much a staple of a comic's back matter as smiling sea monkeys and Charles Atlas' leopard-print speedo. Their decision to scrap it was no doubt motivated by the rise of message boards, fan sites and blogs. I was gonna write this whole post about the letters page as an institution, until I saw that the Washington Post's Comic Riffs blogger Michael Cavna had already done it more wittily/more thoughtfully/better/stronger/faster than I could. Go, read. He makes good points. I'll add only this. One of my favorite aspect of the DC Comics letters page was the "Name the Letter Column" contest featured in the first issue of every new title. Editors would invite reader suggestions, and by issue 4 or 5, the selected name would get its own logo atop the letters page for the duration of the book's run. In 1980, an apple-cheeked, tow-headed, 12-year-old future NPR comics blogger sent in a name for the letter column of a just-debuted book called The New Teen Titans. He began by suggesting a logo: A picture of the teenaged super-team sitting around their kitchen table, smiling as they perused readers' letters over steaming mugs of coffee. His suggestion: KLATSCH OF THE TITANS! On Flex Mentallo, Master of Muscle Mystery and HERO OF THE BEACH! What did they end up naming The New Teen Titans letter column? Well, I'm sure I don't remember. I mean it was 30 years ago and I'm a grown man and TELL IT TO THE TITANS. Seriously. That's what they chose: "Tell it to the Titans." I mean ... right? "TELL IT TO THE TITANS?" I give them gold. GOLD. And they're all, "Oooh, look at us, with our ALLITERATION." I got another alliteration for you, DC-Comics-editors-of-three-decades ago: Fatuous funnybook Philistines. Hunh? HUNH? How's THAT taste?